Pac-Land was originally controlled in the arcade with left and right buttons instead of a joystick. 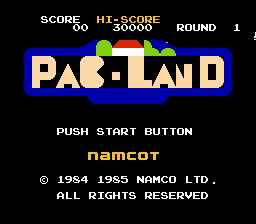 The PCE version had an option to switch the controls to a standard arrangement (with D-pad movement and using a button to jump), but for some reason Namco didn’t think of that when they developed the Famicom version first. This patch will rectify that. 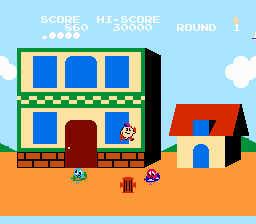 Press SELECT to activate (the NAMCO logo will change color from red to yellow). Source included. KingMike hasn’t tested it through the full game, but it seemed to work for the first couple levels. NOTE: DiskDude-infested ROM used just so the patch can also clean that garbage and fix the mapper from 1 to 0, like it should be. It should work fine on an already-clean ROM as well.